Hello gardeners, future gardeners and Woodsbum’s Mom. 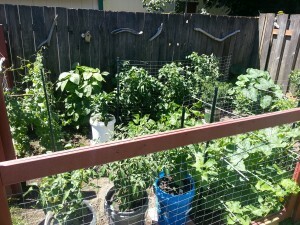 To give a brief introduction of the gardening section of this blog, my mission is to document my gardening season for the year and share some tips that have helped me be successful in growing vegetables. In no way am I a master gardener or claim to be, I just know what has worked and what hasn’t worked for me in the past. Most importantly, I do this all while living in the suburbs. To give a quick background description, this will be my 5th year gardening. The first year I just literally picked up plants from True Value and stuck them straight in the ground. Surprisingly, I had pretty decent success. Second year I had an idea in my head of what a garden looked like so I made this big 50×10 foot garden. I rototilled up the dirt and made mounds of dirt in rows with stepping stones and managed to grow nothing but a bunch of weeds that year. Complete failure. The third year is when I built myself a fenced in 9×15 foot garden and started putting plants in containers. I had a really successful garden season that year and started getting into preserving my harvest. Last year I pretty much knocked it out of the park and by far had my most impressive gardening season yet. This year I feel I have a pretty good grasp on gardening going into the season. Which I’m really excited about. I plan on doubling if not tripling my production this year as long as mother nature is on my side. She ultimately sets the rules. I will have 2 gardens going this year as well as all my container plants. One is at my home and the other is at a community garden in the park. This is last year’s garden. My plans for the gardening sections of this blog are to cover everything from starting seeds to preserving your harvest for the year, whether it be canning or dehydrating, and everything that goes along with gardening in-between. A gardener told me a few weeks back to remember “KISS”. Keep It Simple Stupid. So I plan on keeping that in mind as good advice as I enter into this gardening season and document it here. This entry was posted in DIY Projects, Gardening and tagged food, gardening, gardens, growing plants, suburban gardening on March 25, 2014 by Woodsbum.